In The Young and the Digital, S. Craig Watkins skillfully draws from more than 500 surveys and 350 in-depth interviews with young people, parents, and educators to understand how a digital lifestyle is affecting the ways youth learn, play, bond, and communicate. 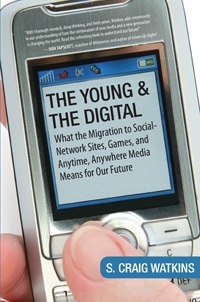 Timely and deeply relevant, the book covers the influence of MySpace and Facebook, the growing appetite for "anytime, anywhere" media and "fast entertainment," how online "digital gates" reinforce race and class divisions, and how technology is transforming America's classrooms. Watkins also debunks popular myths surrounding cyberpredators, Internet addiction, and social isolation. The result is a fascinating portrait, both celebratory and wary, about the coming of age of the first fully wired generation.